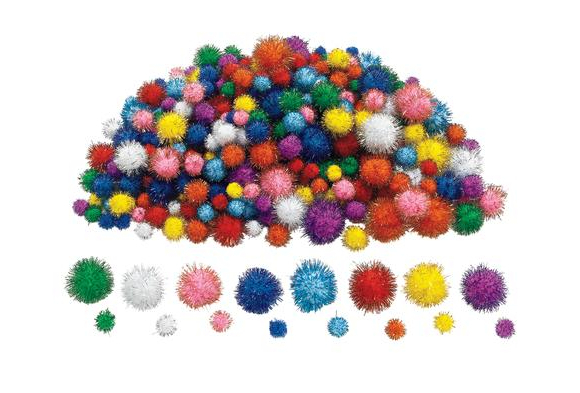 Soft, round, fuzzy, colorful—there are so many great things to say about pom-poms! 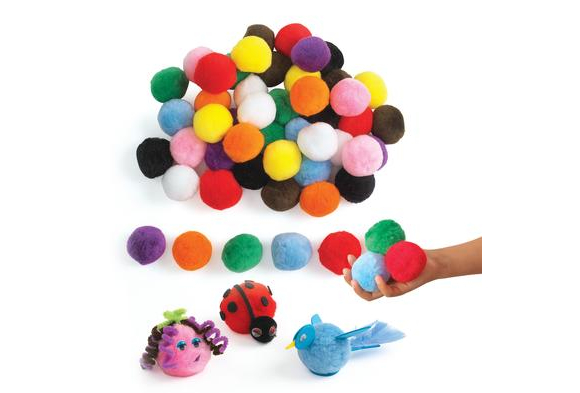 Fluffy little pom-poms are a great way to practice sorting, counting, color recognition, fine motor abilities and many more valuable early childhood skills. Plus, they are a great addition to collage and craft projects. Let's start with the word itself: pom-pom. You can find many current spellings of the word, including pom-pom, pompom and pompon. No matter how it is spelled, there's no denying that it's an appropriately fun word for such a charming ornament! So where does it come from? 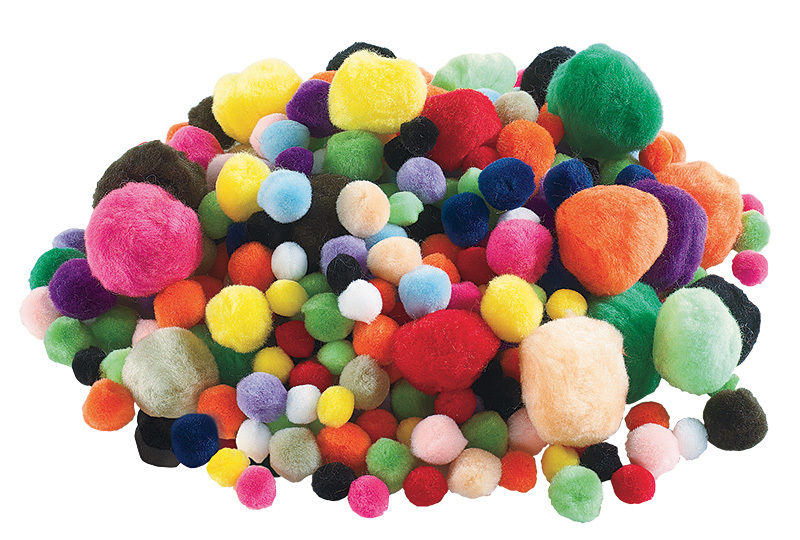 The English word pom-pom came about in the 18th century from the French word pompon, which referred to a small decorative ball made of fur, feathers, ribbon, wool or string. During the 18th century, military regiments across Europe caught site of the imposing Hungarian cavalry and their tall, ornamental hats. These hats were called shakos, and atop the shako sat a large, puffy pom-pom. The military style caught on across Europe, including in Napoleon's infantry where pom-poms could be found adorning soldiers' hats. The color of the pom-pom on top of the hat signified which company the soldier belonged to. Off the battlefield, the pom-pom has often enjoyed popularity as an ornament used to denote status. For example, Roman Catholic clergy have worn square-peaked biretta hats for centuries, with the color of the pom-pom denoting the position of the wearer in the clergy. Two more European hats to prominently feature pom-poms are the Scottish Balmoral cap and the Tam o' Shanters cap. The Balmoral cap dates back to the 16th century and the bright pom-pom affixed on top is called a toorie. And it's not just hats that feature fabulous pom-poms. Pom-poms can also be found on some traditional Turkish, Greek and Italian footwear. Some traditional South American garments for men and women also make use of pom-poms to signal the marital status of the wearer. Fluffy poms can also be found on fringed dresses, coats, socks and other forms of clothing and décor across time and cultures. During the Great Depression of the 1930s, pom-poms were enjoyed as an inexpensive way to embellish any number objects! We can't say for sure who the first person to make and attach a fuzzy ball to their clothing was, but the earliest instance we know of dates back roughly a thousand years. In 1904 on a Swedish farm, a statue of the Viking god Freyr was found.The statue featured a tall hat or helmet with what appears to be a round pom-pom on top. That dates the oldest known use of the pom-pom to between 800–1066 CE! Now that you know a little more about the pom-pom, bring all of that ornamental history into your home or classroom! 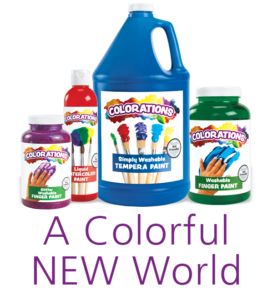 Colorations provides a wide variety of pom-poms for all sorts of educational and artistic projects. 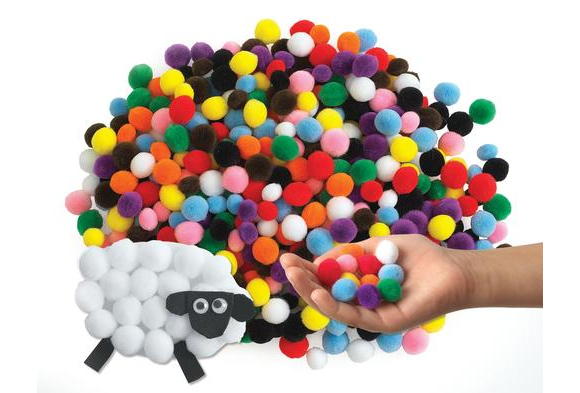 Try our self-adhesive pom-poms, jumbo pom-poms, mini pom-poms, fluffy pom-pom beads and more fuzzy pom-poms. The story of the pom-pom continues!